Termites wouldn’t make good dinner guests. They’d rather eat the table than the food on it. That’s right. Termites love to eat wood. Most of them prefer wet, moldy wood, which is why they live in forests and woodlands. In your home, though, termites are bad news. 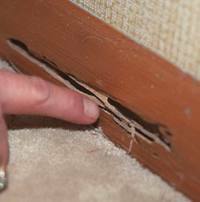 Termites sometimes live in people’s homes, chewing on wood in a damp basement or in the walls. Here, they can cause major damage. 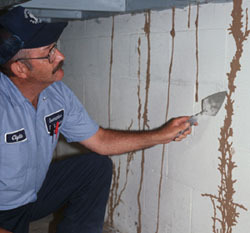 Termites’ damage on a wall. Termites are among the oldest insects. They are related to cockroaches and have been on the earth for over 200 million years. 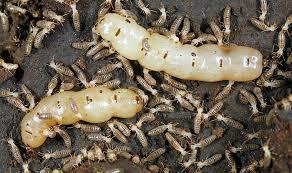 Most termite species live in hot, wet climates, such as rain forests and jungles. Here, they make a tasty snack for lizards, anteaters and other small animals. A few species live in the U.S.
Termites build big colonies. Each colony can have millions of members. Termite colonies have a king and queen. The queen lays millions of eggs during her life. Declan, Tobin. " Termite Facts for Kids ." Easy Science for Kids, Apr 2019. Web. 21 Apr 2019. < https://easyscienceforkids.com/all-about-termites/ >.